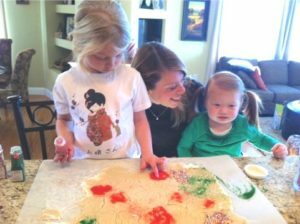 Making & decorating Christmas cookies is a fun tradition in our house. 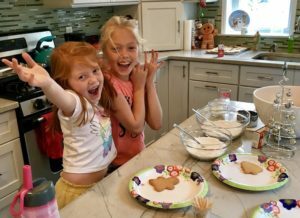 The girls love basic Cut Out Sugar Cookies that they can cut into the various holiday shapes and then decorate them with as much glaze and sprinkles as possible. Since it is really about the decorations, I like this very basic and easy recipe for the cookies. I think that the first time we went all out with the different christmas cookie cutters and tons of sprinkles was in 2013 when Daniela was 5 and Alexa was nearly 2. We were visiting my parents in Missouri and my mom bought a tub of 18 different cookie cutters and red and green sprinkles. It was the start of our new tradition! 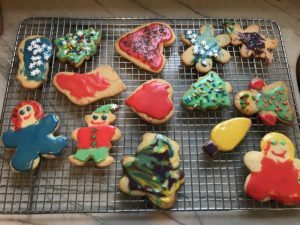 This year, we continued the cookie decorating tradition, though a bit early so I could post it here – I really had to twist their arms as you can imagine :). I let them each make glaze, splitting the recipe in half and giving each girl a bowl to mix. However, then I pour all of the glaze in smaller bowls (I used paper for easy clean up) and let the girls pick their food coloring colors so that we have several different colors. So much fun! Try to roll the dough out evenly at a 1/4 inch thick. You can see here that my girls were a bit overzealous with rolling and where it was too thin, the cookies got a bit brown and were crispier, but still delicious (those in the back in pic below). 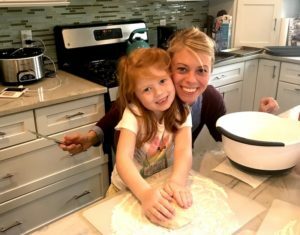 I bought a kid-size rolling pin, which is great for them! Check out my Shopping Page to see the rolling pin and 18-piece cookie cutters. In terms of decorating with kids, my advice is: don’t worry about these being beautiful. The key is that everyone has fun and that the kids feel like they truly created their own little masterpiece. Have Fun! 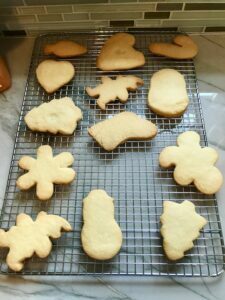 This is a simple sugar cookie recipe that you can roll out and use cookie cutters with to create any shape you want. The glaze is also very simple with only three ingredients. In a large bowl combine butter with sugar, eggs, vanilla extract; beat on high using an electric mixer until fluffy. In a separate large bowl combine the flour with baking powder, baking soda and salt; gradually stir into the butter mixture until completely blended.